A diagnosis of a mental illness is a sticky label that is difficult – sometimes impossible – to shake off. Readers’ panel - Should the government rethink the 2012 NHS reforms? Readers’ panel - Should we ditch the pay review body in favour of direct negotiation? 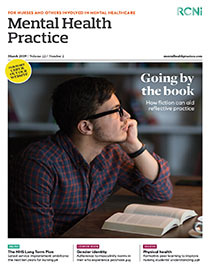 Readers’ panel - Will the Nurse First programme improve recruitment? Readers’ panel - Should hospital food meet legal standards for quality? Readers’ panel - Should trusts offer ‘golden hellos’ to attract nurses? Readers’ panel - Should longer GP consultations be a priority for the NHS?